I transformed my family’s favorite pizza into a super simplified version. 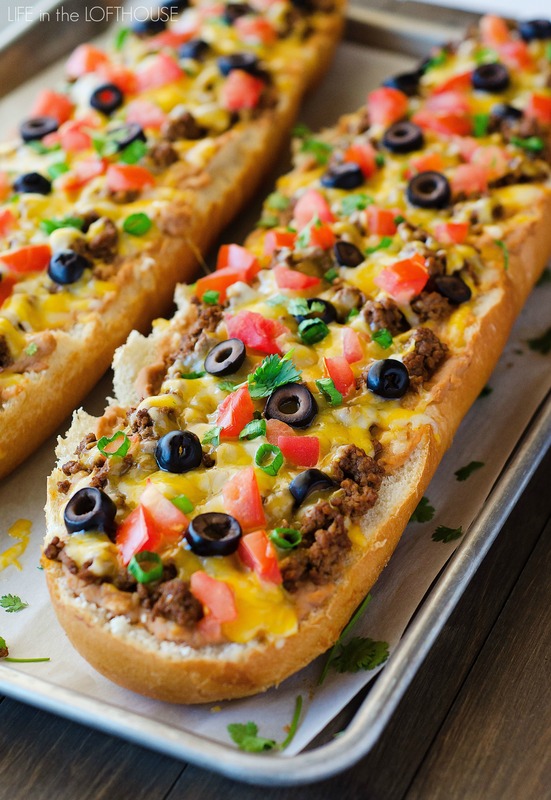 Here my friends, is Taco French Bread Pizza! Ready in less than 30 minutes and sure to satisfy everyone’s taste buds you feed it to, and that is a promise! 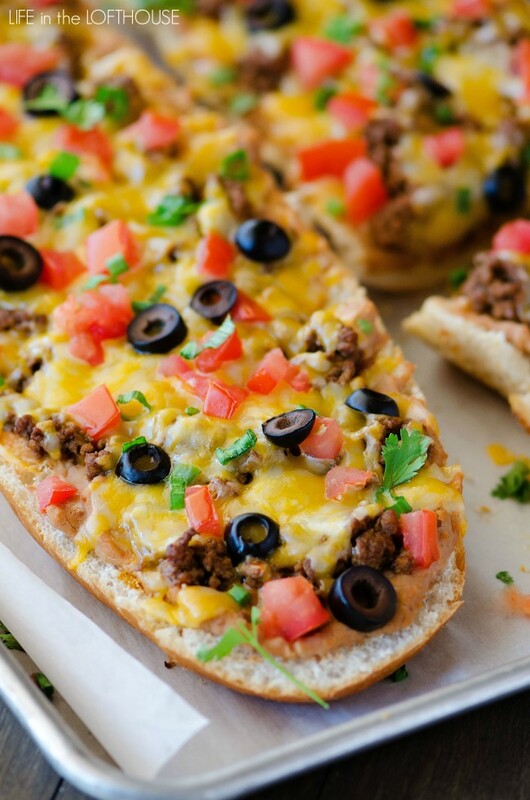 All the flavors of a taco transformed into a pizza! 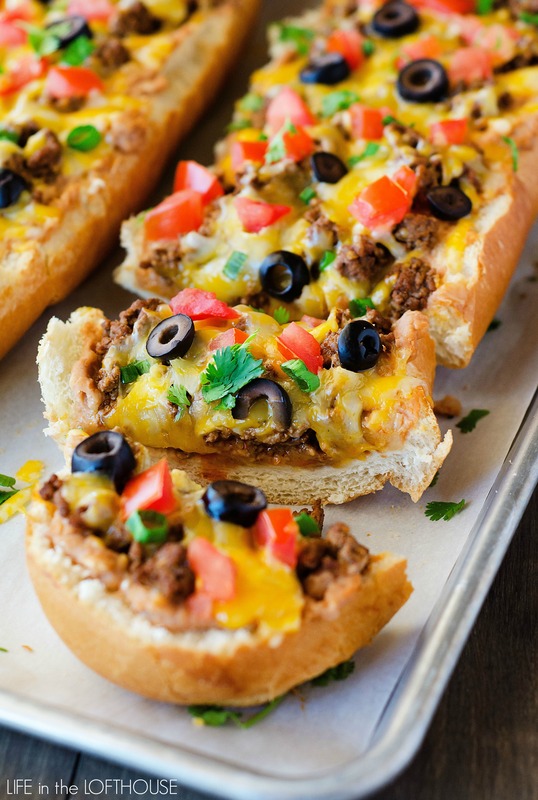 Using french bread makes it extra easy and delicious! Preheat oven to 375 F°. Brown ground beef in a large skillet, over medium-high heat. Drain grease. 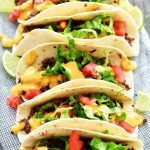 Add taco seasoning to the ground beef according to package directions. Simmer 10 minutes, then remove from heat. Slice french bread in half lengthwise. Place both halves on a greased large cookie sheet. Place refried beans into a microwave-safe bowl. Microwave for 1 minute. Stir well and then spread beans evenly over the top of french bread halves. Then top evenly with the cooked ground beef mixture, sprinkle with cheese and then add the tomatoes, black olives and green onion. Bake 12 to 15 minutes, or until cheese is melted and bubbly. Remove from oven and let stand 5 minutes before slicing and serving. Enjoy! Leftovers stay good covered in fridge for 1 day. I’m hungry and don’t want to make this myself but I’ll save this recipe. It looks so good. This was a big hit last night with my family. Everyone came back for seconds. Even my two year old son. Looks delish! Have you ever tried to freeze any of your french bread recipes? Made this tonight and everyone loved it! I used my homemade beans which added even more flavor. I made this last night and it was a huge hit in our house! Thanks for the recipe! Yay! glad you loved it! Have you ever tried to freeze any of your pizzas (french bread or regular)? This was a hit. Super easy to make. Thank you. Loved this. 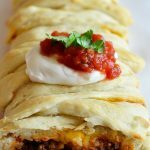 So quick and easy to make and I always have the ingredients on hand. I froze half of it before baking and it worked out fine. I just wrapped it in foil and when I went to use it I took it out and put it straight into the oven on a baking sheet, frozen. I unwrapped it half way through so it would get a nice crunch. This is SOOOO good. Do you know how many calories are in this pizza? I make a version of this, and I have to say I like your recipe better.